Cosmetic acupuncture is based on traditional Chinese medicine, and so it is very healthy for not just your face and neck, but for your whole body. The system we use is called Mei Zen Cosmetic Acupuncture. It is based on research and many years of clinical experience. Only very small and solid needles are used. There are no injections, no recovery time, and all products used are non-toxic and safe. This is one of the healthiest cosmetic procedures available. In addition it is less expensive than many other cosmetic techniques. The way it works is by stimulating the matrix of collagen and elastin in the dermis. This is the area deeper than the surface of the skin, and if stimulated will bring the best results. During the cosmetic treatment we also work to get your body as healthy as we can. Your face and neck will, as a result, reflect your improved health. Treatment can include one or two different courses. One course focuses on the face, forehead, cheeks, nose, mouth, and eye areas. The other focuses more on the jaw and neck areas. Skin is softer and more vibrant. Fine lines reduce and may even go away. Deeper lines appear more smooth and as a result much less harsh. Crows feet reduce or go away. Acne and also rosacea improve. The jaw line will appear more defined and jowls minimized. Skin tone becomes more consistent and redness is considerably reduced. Little hard spots go away. In addition this is an effective treatment for Bells Palsy and stroke paralysis. Anxiety is improved and you are more relaxed in general. Hot flashes and nights sweats are reduced or go away. Digestion is improved, so problems like constipation go away. There are less PMS symptoms. Menstral cycle is also more balanced. Stress and mood are improved. A course of treatment takes 10 weeks. Two treatments per week for the first 5 weeks, then one treatment per week for 5 weeks (total of 15 treatments). After treatment is finished it takes just one treatment per month to maintain. Results last a long time, 2 to 5 years. At that point we repeat the original course of treatment. Results usually will not happen in 1-2 treatments, rather, it takes time to create change in the matrix. So, results take at least 4 weeks. 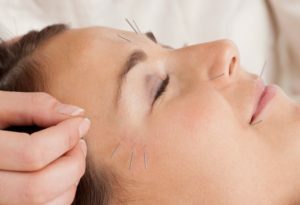 We offer cosmetic acupuncture treatment packages at a discount. Click on the Book An Appointment button to the right or below, or call 719-551-8522, to schedule.